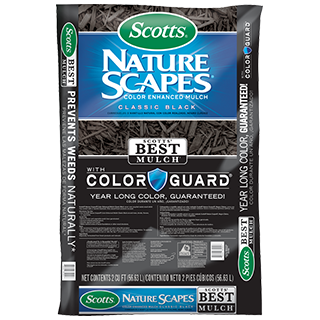 Choose a mulch that instantly adds beauty and takes care of your landscape. Scotts® Nature Scapes® Color Enhanced Mulch is protected by ColorGuard Technology, so you will have year-long color guaranteed! 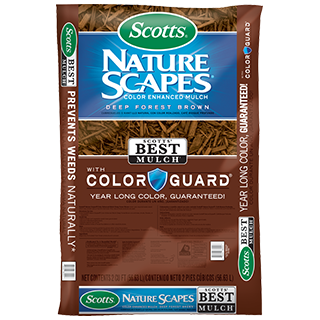 At the same time, the mulch helps soil retain moisture and prevents weeds naturally. 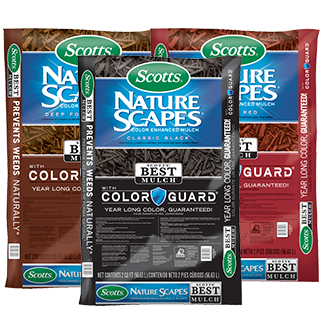 Build a better landscape that you know will look great with Scotts® best mulch. At a depth of 4 inches, 6 sq. ft. of bedding. Not Available in: American Somoa, Connecticut, Delaware, District of Columbia, Florida, Guam , Indiana, Kentucky, Maine, Maryland, Marshall Islands, Massachusetts, Federated States of Micronesia, New Hampshire, New Jersey, New York, Northern Mariana Islands, Palau, Pennsylvania, Puerto Rico, Rhode Island, Texas, Virgin Islands of the U.S. Vibrant, year-long color - guaranteed! This is not the product label. Always read and follow the product label before use.